The Tea, as it is taken inwardly, is prepared in two different ways. The first is used by the Chinese, and is nothing else but a simple infusion of the Tea-leaves in hot water, which is drank as soon as it hath drawn out the virtue of the Plant. The same way of drinking Tea hath been also introduced in Europe, and is now so well known to every body, that it is needless to add any thing about it. The other way, which is peculiar to the Japanese, is by grinding: The leaves are a day before they are used, or on the same day, reduced into a fine delicate powder, by grinding them in a hand-mill made of a black greenish stone, which is call’d Serpentine Stone. This powder is mix’d with hot water into a thin pulp, which is afterwards sip’d. This Tea is call’d Koitsjaa, that is, thick Tea, by way of distinction from the thinner Tea, made only by infusion, and it is that which all the rich people and great men in Japan daily drink. 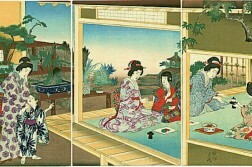 It is made and serv’d up in company after the following manner: The powder enclosed in a box, and the rest of the Tea-table furniture is brought into the room, where the company sits. Then all the dishes are fill’d with hot water, and the box being open’d, they take out, with a small neat spoon, about so much of the powder as would lay on the point of a pretty large knife, and put it into every dish: After this they mix and shake it with a curious denticulated instrument, till it foams, and so present it to be sip’d, whilst it is hot. 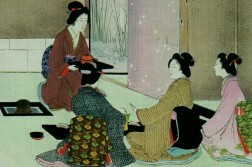 There is still a third way of making the Tea by a perfect boiling, which goes farther than a simple infusion, and is used by the vulgar and Country people, who drink of it all day long. Early in the morning, and before sun-rise, one of the domesticks gets up, hangs the kettle over the fire, fills it with water, and puts in, either when the water is cold, or after it hath been made hot, two, three or more handfuls of the Bantsja leaves, according to the number of heads in the family. At the same time he puts in a basket, of that size and shape which exactly fits the inside of the kettle) by this means to keep the leaves down to the bottom, that they should be no hindrance in drawing of the water. This kettle is to serve for the whole family all day long, to quench their thirst. Every one, who hath a mind to drink, goes there, when he pleases, and with a pail takes out as much of the decoction, as he will. A bason of cold water is put by it, that in case people have not time to sip it leisurely, they may cool it to what degree they please, and quench their thirst without delay, by taking large draughts at once. Some leave the basket out, and instead of it put the leaves into a bag, which answers the same end. Only the Bantsja leaves must be boil’d after this manner, because their virtues are more fix’d, and consisting chiefly in the resinous parts could not be well extracted by a simple infusion. 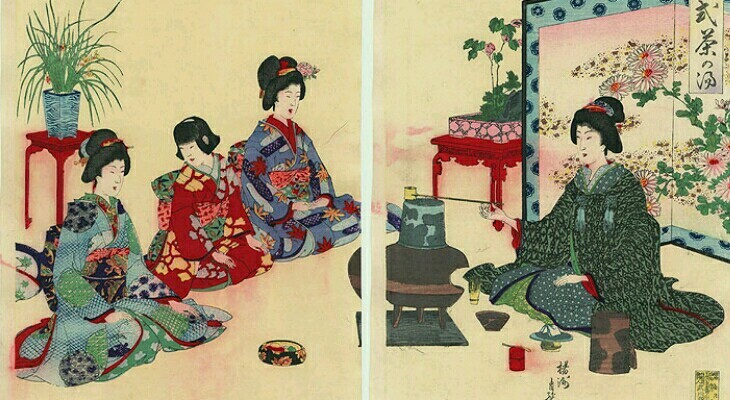 It is a particular art to make the Tea, and to serve it in company, which however consists more in certain decent and agreeable manners, than in any difficulty as to the boiling or preparation. This art is call’d Sado and Tsianoi. 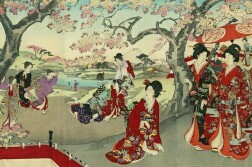 As there are people in Europe, who teach to carve, to dance, to fence, and other things of the like nature, so there are masters in Japan, who make it their business to teach children of both sexes, what they call Tsianosi, that is, to behave well, when in company with Tea-drinkers, and also to make the Tea, and to present it in company, with a genteel becoming and graceful manner.